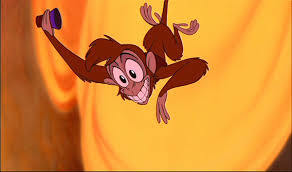 I was in the Abu unit on “Aladdin” under Directing Animator Duncan Marjoribanks, I was given whole sequences of the character and animated all the monkey scenes in those sequences. This was great because I could sustain Abu’s performance through consecutive scenes, which makes for consistency and fun. 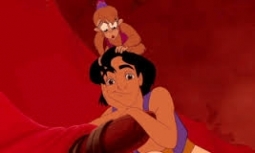 Two of my sequences were the monkey in the marketplace (Aladdin meets Jasmine,) and Abu goes to bed. There was lots of fast action on Abu, and somewhere toward the end of the film I realized I could see on ones. I could see each of the 24 drawings projected per second, and see which drawings needed correcting when trouble-shooting my pencil tests. Seeing the action in detail without slowing down the scene was huge. Check out my hand-drawn animation clip of “Aladdin” (@ 0:08 sec) on my Animation Theater Page. No wires, no special effects. Just me in the discard pile. This is one half of my discarded drawings when I was animating in the Abu unit. And . . . yes, I only cleaned out my desk 2 times during the one or two years of production on a film. Hundreds of drawings just happened to form a funnel in the wastebasket. How unusual! I invited some of my friends to interact with the funnel before hauling it to the recycling bin. Their photos will follow as consent is granted. I think I learned more about squash and stretch from working with Duncan. Particularly squash and stretch at the same time within the same character–as in squash on one side and stretch on the other. I use this in my sculpture poses as much as possible. My stone sculpture, “Squash and Stretch“, shows squash in one ptarmigan and stretch in the other.